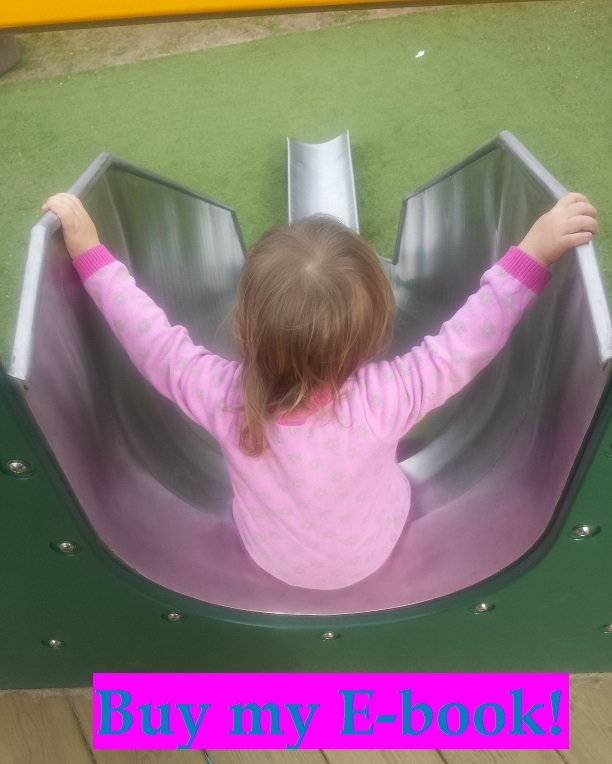 So, you may be reading this blog and thinking “Why Katese11 (for that is my real name), it’s all very well recommending all these lovely places to take my toddler but how the heckatty do you actually get to any of them? 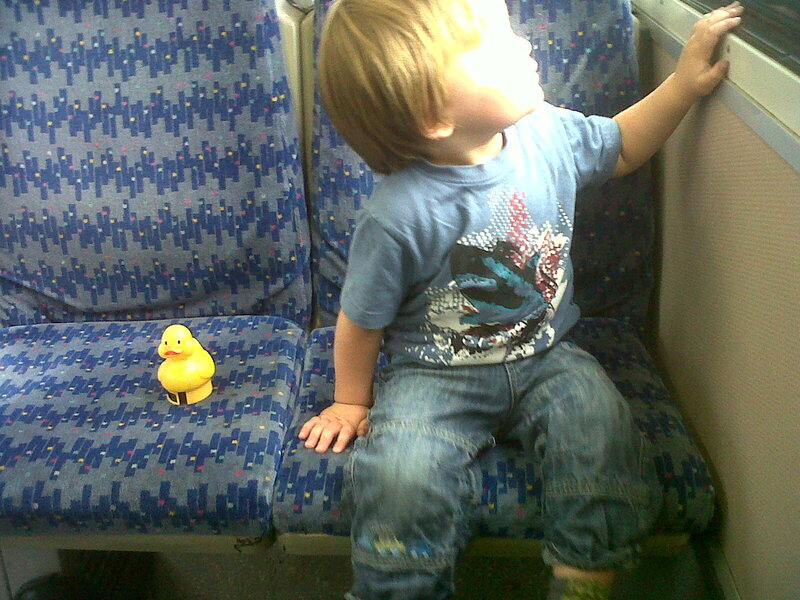 Isn’t London transport a nightmare at the best of times, let alone with a toddler?” To you I say two things – firstly, it’s not that bad…and this post will hopefully explain some of the ways you can make it better. Secondly, heckatty? What does that even mean? Here’s a starter for nothing. If you are one of the many people I know that can carry a toddler all day in a sling, then you have been given the freedom of the city! Nothing is out of bounds for you – tubes, overland trains, boats…it’s all yours. Ditto if you have a toddler that will happily walk all day and be trusted not to run into the road repeatedly. If, however, you have the kind of puny back muscles that I have and so cannot carry your toddler let alone the huge amounts of stuff they seem to come with, then you need to rethink. Again, if you have a toddler that can walk but thinks that “red man” means “mid-road dance time”, then you need to rethink. In both cases, you may find yourself stuck with a buggy. And that’s the starting point for this point for this post. If you have a sling-er or walk-er, go straight to the next post (don’t – there’s nothing there yet). 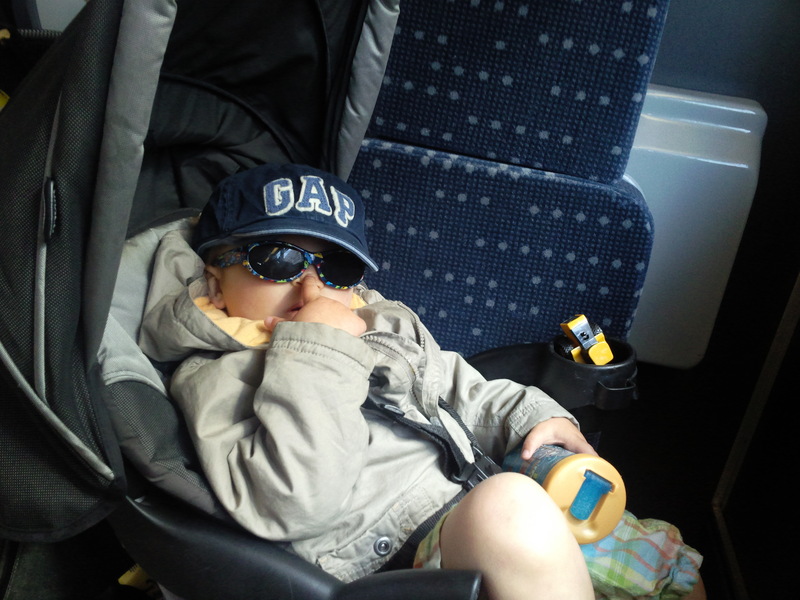 For good buggying on public transport, it’s handy to have a lightweight pushchair. 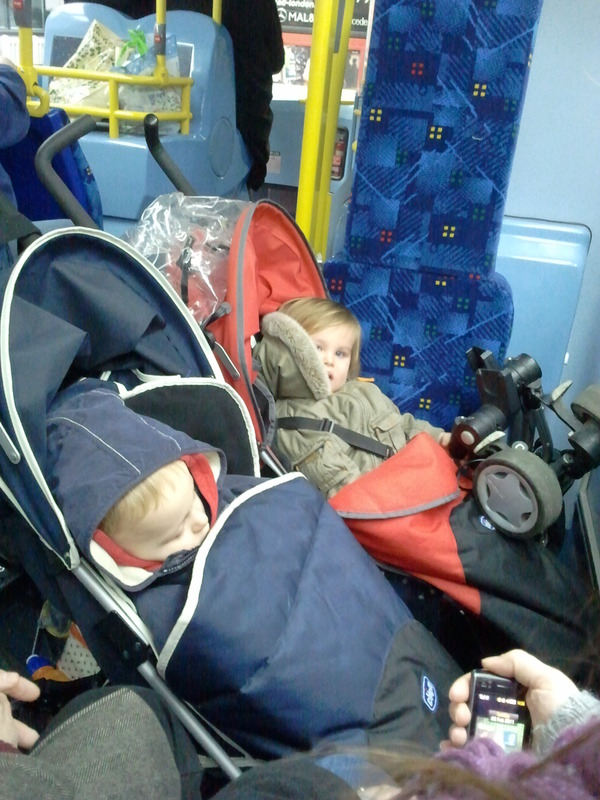 In the picture above, Roo and his friend Luke have the same Asda lightweight stroller (it’s called the Chicco Winter or something) and look how much space there is! Lovely! It also had the tightest little turning circle. In the long run, seemed like it was too lightweight and it died within six months but we do work our buggys hard. Plus it was only £50.00. Our current buggy is hefty, clumsy and a bit of a monster for public transport but it was one we found on the street, so we can’t be too fussy. True story. If you need the benefits of a stroller type pushchair explained, here they are – it’s lighter (in case you need to lift it down any stairs but also so it’s less effort to hold on an escalator), narrower (so it fits alongside other buggys on the bus better) and has a smaller turning circle (to negotiate busy buses). The picture above is our current buggy and you see what I mean? Hefty. But it was free. Dinosaur not included. Second tip is to minimise changes. All but one of the places I’ve blogged about have been just one mode of transport away cause I really can’t be arsed with the getting on and off all the time. If I was in a tricksy mood, I would make you guess which one required more than one mode of transport but I’m not – it was the Museum of Childhood in Bethnal Green. A classic example of how slinging makes life easier- meeting a friend there who lives near me she took the tube, toddler on back, and made it in half an hour. 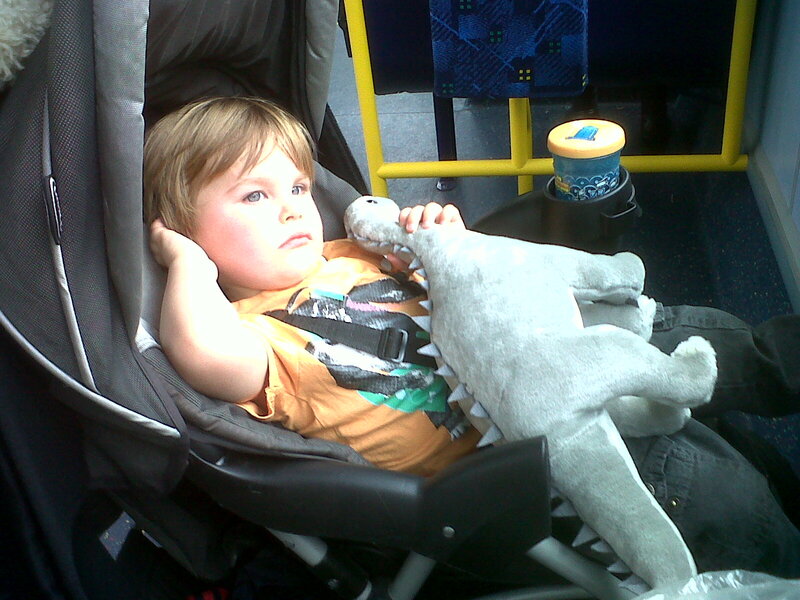 Burdened with a buggy and fearful of that difficult spiral staircase at Bank, I took the bus and twice as long. But generally speaking, I just get on one thing and stay on it. Admittedly, I do live in an area which has lots of easy transport links *engage smug mode* but also I’m prepared to have longer bus journeys (pack cheesey biscuits, juice and books) and further to walk to and from bus stops either end. It just seems easier – once you’re settled in that buggy area nothing is technically allowed to shift you. Except a wheelchair. And that hasn’t happened to us yet. I should point out that this is a recent change of attitude. In the olden days when Routemasters roamed the Earth, I had a travelcard and no baby and would frequently “bus-hop” from one Routemaster to another just to get past a traffic jam (it always seemed to be in Whitehall). But those were different times…. So, buses! It’s ironic (in the Alanis) sense that I decided to write this post today because I had two bad bus experiences to and from the Transport Museum. Both times were a question of bad bus etiquette which I’ll share with you for your education and not because I’m ranting. No no. The first one started at the bus stop. There is always a sense of awkwardness when you’re at the bus stop and there’s another buggy there. It’s like you’re hoping the other buggy wants any bus but yours. 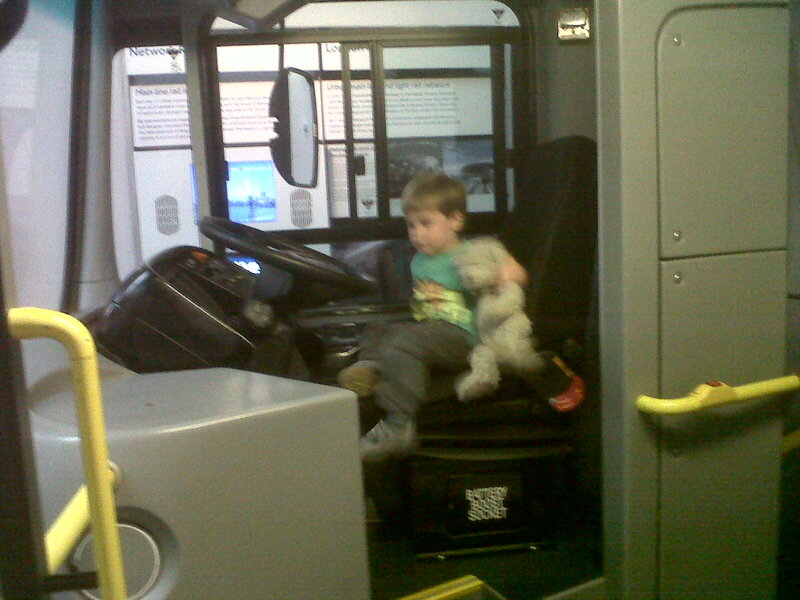 If it was somewhere but London, you’d probably attempt a conversation with this other parent to establish whether or not they did want your bus but This Is London. And we do not do such things. So, we were both waiting and along came the 59. We both moved to get on it. I let her go first because (good bus etiquette alert!) she was there first. She could see me coming on too but she parked the buggy lengthways across the buggy space. Now, that just doesn’t work. The only formation for two buggys in the space (as modelled by Roo and Luke above) is side by side, facing the window. Preferably with the toddler positioned out of reach of the big red button. So I just stood there for a bit and she didn’t get the hint. So I said “excuse me, sorry” (words you use a lot while taking a buggy on a bus) and eventually, she moved her buggy (it was more of a pram really, so I’ll assume she was a learner driver) so it was at a diagonal. Again, not ideal but I managed to get the buggy in. As previously discussed, it’s not a skinny model. But I did it, just. The way home was even worse. I got on and started pushing down through the bus (I’ve heard rumours that you can get on using the back doors and pay later but I’ve never seen anyone actually do this) and a lady standing just by the driver refused to move. She squeezed herself against the wall – no, still not enough space- and then moved towards me – nope, still not working – but didn’t move backwards, which was surely the sensible thing to do. So I ran over her feet. She had ample bracing time. Reaching the buggy spot, there was another pram parked there. Another teensy gap. Now, I’m pretty adept at steering the monster but I can’t defy physics. Even though my third cousin was a famous physicist, he never passed on the secret of how to y’know bend time and space. I only wish he had. So again I hinted, again I said “excuse me”, the person I assumed to be the mother wasn’t, so she didn’t move it. And neither did the actual mother. So in the end a man grabbed it and roughly pushed the buggy past the pole (possibly bending the wheel in the process – who knows?) and got Roo in, if at a 45 degree angle that looked extremely uncomfortable for a boy with a crotch strap. Thank goodness for padded nappies or I’d never have grandchildren.You see, the trick to getting two buggys in that space (whatever their size) is to put one in sideways on (facing the window, as above) then push it directly sideways, tip forwards slightly to get past that awkward pole, then tip back and push it into position, next to the padded wheelchair back bit. Ta-da, you have space for another buggy! But as I said, these were rookies. I guess I forgive them. But buses are not your only option, no no. Although the tube network is largely unaccessible, there are ways round this. If you use tube stations with only a few steps, the toddler can get out and walk down holding your hand (assuming he’s not asleep) while you bump the buggy down, with the other hand. Takes some practice. But here’s the amazing thing – some tube stations ARE accessible! Going to Walthamstow from Brixton the other day, I was amazed that there was not a single step in Brixton tube from street to train. And all the lifts were in working order. On New Year’s Day and everything! Blackhorse Rd at the other end is a regular haunt of ours, so I know that it involves one escalator and nothing else. Taking a pushchair on an escalator is scary and requires a firm grip (always push the buggy on first then lean it on your chest going up or just hang onto it going down) but again, you get used to it. Please don’t sue me if you and/or your toddler fall down an escalator. Anyways, bits of the Victoria Line are easy buggy-wise (Vauxhall is a lift+escalator, Green Park is allegedly now entirely step-free) and the new trains have buggy spaces and everything! The new end of the Jubilee Line (i.e. Waterloo to Stratford) is all pretty accessible. Northern Line tends to involve 10-20 steps, as does the Bakerloo. A good tip is to use the Journey Planner on the tfl website, which allows you to select “accessibility options” and tick things like “I cannot use stairs” and “I cannot use escalators” (it’s under “advanced options”). There are some glitches in it, and it may try and send you through Oxford Circus at rush hour but mostly it’s useful. Another tip – avoid rush hour. But you knew that, right?! Other options-wise, overland trains are handy links and toddlers love choo-choos but they seem to involve a LOT of steps. 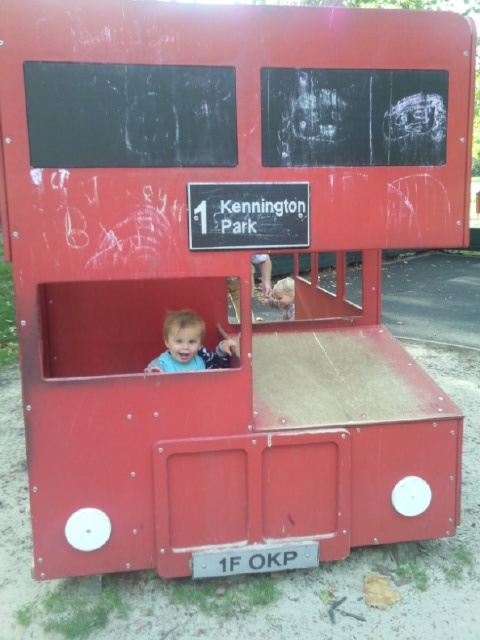 I’ve been caught out that way at both London Fields and Kentish Town. Probably 30-40 steps at each. A handy one that people always forget is the Thames Clipper. No steps at all! Granted, it will only go to and from very specific places but it’s been dead handy for us getting back from Greenwich and Docklands. Talking of these two places, an almost entirely useless link is about to open over the river in the form of a cable car. I know this as we sat in one of the cars in the Transport Museum today. I can’t think of a single occasion when I’ve needed to get from Greenwich to Docklands but I may go visit just for the fun of it. This entry was posted in What I suppose you'd call "tips"....? and tagged buses, choo-choo!. Bookmark the permalink.